Ubisoft company, the publisher of many high quality and popular games, continues to please the fans of its projects by revealing the pleasant news and surprises. At this time we are talking about Watch Dogs game, which has got a collector's pack and the video to it yesterday. Thus, Watch Dogs collector's edition is titled DedSec and contains a lot of interesting things. In the box you will find a 23-centimeter statuette of the protagonist - Aiden Pearce, the steelbook, a map of Chicago, an album with colorful artworks of Watch Dogs (more than 80 pages), the soundtrack, a set of four cards of augmented reality, three exclusive badges, as well as additional game content (different kinds of rewards and three solo missions, which offer you 60 minutes of additional gameplay). 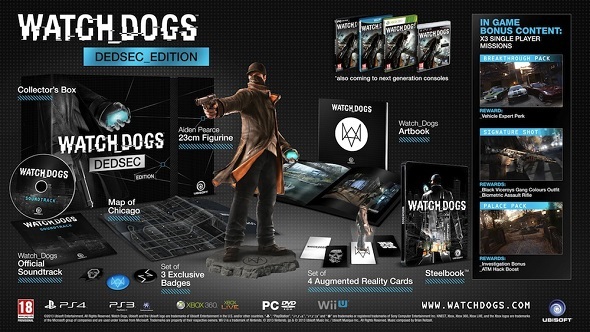 Watch Dogs collector's edition is already available for pre-order in Europe, Asia, Australia and the Middle East. And so you can decide whether you should buy DedSec box or not, we offer you to watch a short video, published yesterday by the publisher of the game and showing all items mentioned above.